We made it to Iceland! After the rockiest 17 hour ferry ride across the North Atlantic Sea from Torshavn in the Faroes, we arrived in Seydisfjordur in Iceland, our 14th country! 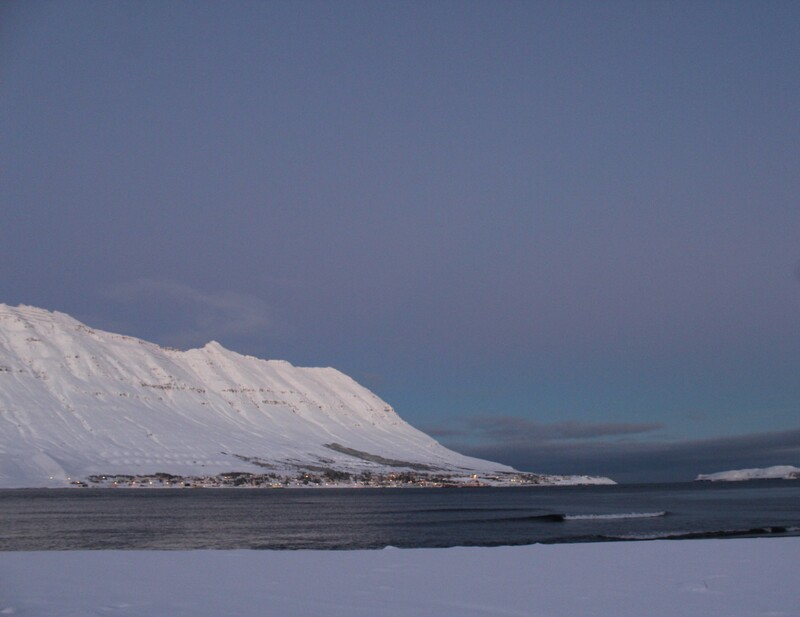 Since it is winter and nearly Christmas, not many people were on the boat to Iceland. It kind of felt a bit eerie being out in the north Atlantic sea, the boat rocking, and not many people around. There were probably about 20 passengers compared to a couple of hundred on the way over from Denmark to the Faroe Islands. It was quite funny at the ferry terminal in the Faroes, as not long after we arrived and got our gear back on our bikes, a man from Smyril line (the ferry company) asked if I’m Elizabeth! I said yes… and he handed us our ferry tickets. I asked how he could guess who I was and he said we were the only ones who had booked tickets with bicycles haha. At the time, everyone in Iceland was hunkered down because they were going through one of the worst storms in 25 years. The guy with the tickets asked if we were aware of this, thinking we were mad, going there with bicycles. He gave us our tickets and wished us luck. Instead of paying for the cheapest option like we did on the ferry from Denmark to the Faroes, we treated ourselves to the next level up which was our own little cabin with bunk beds and an ensuite. It even had a TV! It felt like we treated ourselves to a hotel. Friends of ours in the Faroes said that they were genuinely worried for us as the ocean was very rough due to storms. Our ferry was actually delayed by a day because of severe storms in Denmark. So as soon as we boarded, we had a quick dinner and went straight to bed around 8:00pm, hoping that we would have an undisturbed sleep. Well it didn’t quite go to plan as we both woke up due to the rough waters. I constantly had to have a foot pushing against the wall to try and keep myself in one spot. The boat was rocking from side to side and whatever things we had on the bedside table fell off in one quick motion. It really felt like the boat was going to tip over. Both Kel and I had to leave the cabin at different times and get some fresh air. It was a horrible night. Thanks to Natascha for giving us seasick tablets which really helped even though it was still so bad for us. I can’t imagine what it would have been like without them! However! As morning came, we went to the deck and were absolutely graced with the beauty of Iceland!! We sailed along the east coast for a couple of hours until we reached Seydisfjordur and we had that nervous excitement feeling of being in a new place. It looked magical from the boat and was an amazing sight. We sailed between two mountains covered in snow and it was just us on the deck soaking it all in. I quickly spotted the roads covered in … Ice haha. Well, it’s Iceland so what did I expect?! When the car ramp went down onto land we slowly wheeled our bikes onto the road/ice. We had to be extremely careful as it really was like we were walking on a big slab of ice and at any moment we, and the bikes, would end up on the ground! Customs was the next stop. We were wondering how this would go as Kel has been in Europe for much longer than 90 days in the Schengen area, which Iceland is a part of. However, New Zealand and Iceland have an arrangement where they can visit for up to 90 days despite any time in the Schengen so that worked out perfectly! We had heard though that not all immigration staff are aware of this and it can be a bit of a hassle. We wouldn’t have been able to go to Iceland if he was travelling on an Australian Passport. Thankfully that hassle is taken care of for me thanks to my dad who was born in the UK! We got questioned if we would be riding around Iceland to which I quickly replied NO!! They asked how long we were planning to stay; around three months. ‘Have a good trip! Be careful on the ice!’ The garage door opened and we were free in Iceland! The town we are in now is called Neskaupstadur. It is small fishing village with around 1700 people. For such a small village it has everything you need! A hospital, post office, two supermarkets, a few shops, café, restaurant, two petrol stations, school and a tafe and best of all: picturesque views! It is located in the East of Iceland in a fjord. There are mountains all around and our apartment looks out onto the water and more mountains on the other side. At this time of year everything is covered in a white blanket of snow which makes everything look even prettier. Whenever I’m inside I constantly look outside in awe at the view. Everyone seems very friendly here. Walking in the street, locals say hello to us and kids walking their sled up the road kindly say hello too. I had a nice chat with the lady who has a café/wool shop. Most houses are decorated with Christmas lights, as is the street lights and the village Christmas tree is up too, right next to our place giving the whole village a lovely Christmassy vibe. Can’t decide whether it’s desolately beautiful or beautifully desolate, one thing for sure, it looks fecking cold !!!! !